Well I don't think David Bailey's got much to worry about. This blurry pic was sent to Know Your Mobile, and the tipster claims it's the Samsung Galaxy S3. They also claim the handset will feature a 4.8-inch screen. It's pretty hard to tell, with a picture of this quality, but let's look at the evidence. The source says there are no hardware buttons on the device, though the same source previously sent the same site a pic showing buttons apparently Photoshopped in. The screen size claims are also dubious. The source says it measures up at 4.8-inches, but over at Pocketnow they've gone all mathematical on us: busting out Pythagoras' theorem, they calculate the screen measures 4.74-inches. Previous claims peg the screen at anywhere between 4.65-and 4.8-inches. So while this could be the genuine article, it's far from conclusive. Not long to wait now until we know for sure. 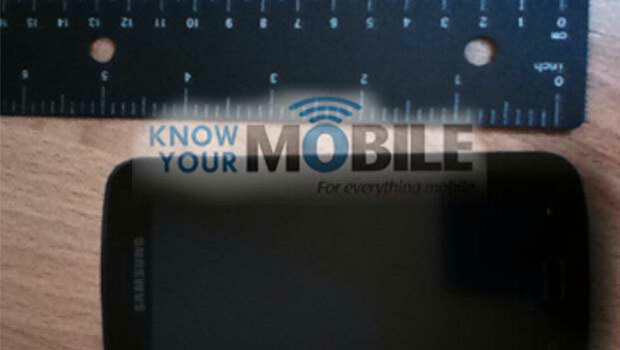 Samsung is set to unveil the Galaxy S3 on Wednesday evening at an event in London. Recently the manual leaked -- if that was genuine, we're looking at a 4.8-inch screen and 8-megapixel camera. Though then yesterday a version of the same handset but running Windows Phone 8 was touted, and the source there claimed the S3 will have a 4.7-inch screen and 12-megapixel snapper. So it's anyone's guess really.